Alcatel's One Touch X'Pop is the "X-traordinary" device of the Go Pop devices in the manufacturer's new smartphone line-up. This device provides more mainstream sized screen compared to its smaller Go Pop cousins. 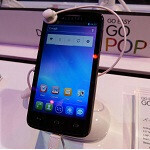 The X'Pop has a 4.5-inch qHD (960x540) display which provides a crisp view of Android 4.0 Ice Cream Sandwich, which is largely stock. Under the hood is a dual-core 1GHz MediaTek processor. On the back of the device we find a 5MP camera with an LED flash and on the front is a VGA camera. Users have 1.4GB of native storage available, and that can be expanded by microSD cards. Like the rest of the Go Pop devices, the X'Pop is a quad-band GSM handset supporting HSPA on 850/1900/2100MHz. In keeping with the constant theme at the CES exhibit, Alcatel did not provide any pricing, availability dates, or carrier support.